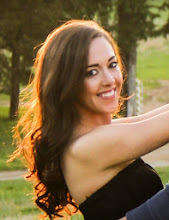 I have a wonderful recipe to share with you guys today. This meal came about pretty haphazardly and I wasn't necessarily planning on blogging it -- but it turned out so darn good. One day this week, I woke up in the morning and had no idea what I'd fix for dinner. We didn't have many meat choices in the fridge and the pantry was pretty bare. I saw that we had some fresh squash and zucchini so I knew I wanted to use those... but how? I couldn't decide, so I just threw some chicken breasts into the crockpot to cook, figuring I'd think of something to put together while at work. I didn't. 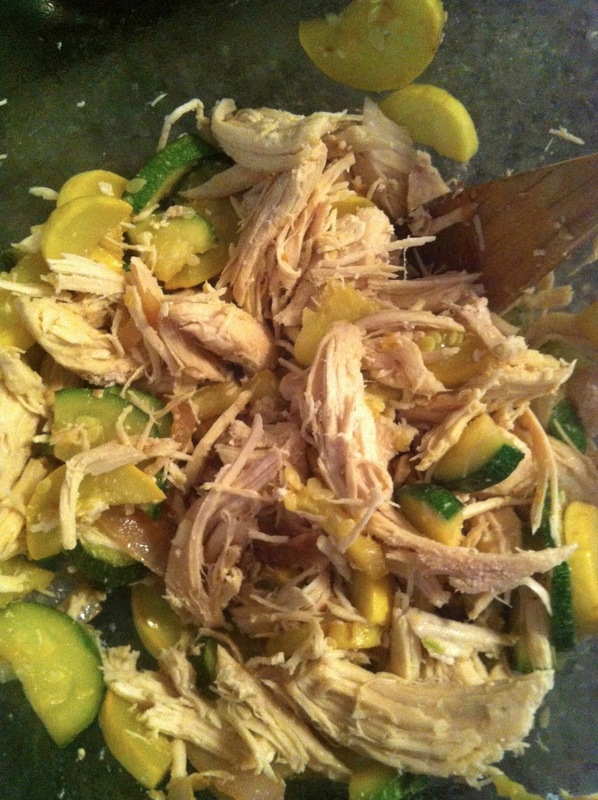 I came home to cooked chicken breasts that I then shredded and some squash and zucchini. I scavenged through the pantry and found some orrechiette pasta -- yum! I immediately envisioned a creamy, summery, baked combo of the little shells with shredded chicken, squash and zucchini, caramelized onions, and cheese. Since the pasta would be a bit of a splurge though (not whole wheat! 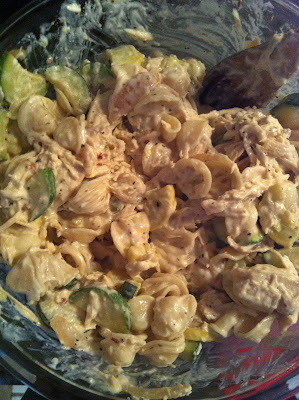 ), I had to make it creamy in a healthy way -- I looked in the fridge and found greek yogurt and almond milk. Perfect! Only a small amount of cheese is used. No butter. And since this recipe also includes a hefty serving of chicken and vegetables, each serving only contains about 2 oz. or less of pasta. It's definitely a lightened up version of a creamy pasta bake! I had never used almond milk in a baked recipe before, and greek yogurt can be hit or miss when you use it in cooked recipes, so I wasn't totally sure this would work. But it came out creamy, a little tangy, and very flavorful. Success! Prepare your shredded chicken breasts. 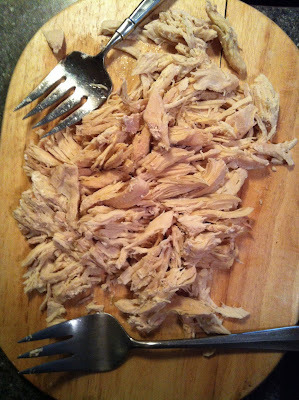 You could use the breast meat from a rotisserie chicken, boil chicken in chicken broth, or use your crockpot like I did. I broke some cooking rules and just threw a few frozen chicken breasts right into the crockpot with some chicken broth and water in the morning. Set it to low and cooked for 8 hours or so. Perfectly fine. Chicken breasts that aren't frozen only take 4-6 hours in the crockpot. Then just shred with 2 forks. When ready to cook, preheat the oven to 375. 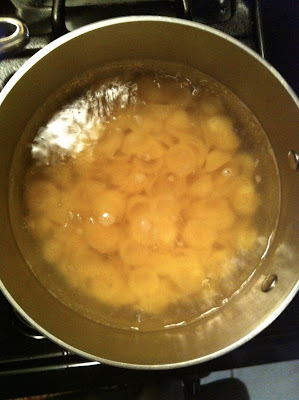 Prepare your orrechiette according to package directions and cook until al dente. You could obviously use another pasta here -- penne or rigatoni or macaroni would be great. And by all means, use whole wheat pasta if you'd like to step the health factor up a notch! Next, cook your veggies. Heat 2 tbsp of olive oil over medium heat. Add in about a quarter of a red onion, sliced. Cook until the onions begins to brown and soften and sweeten, about 10 minutes or so. 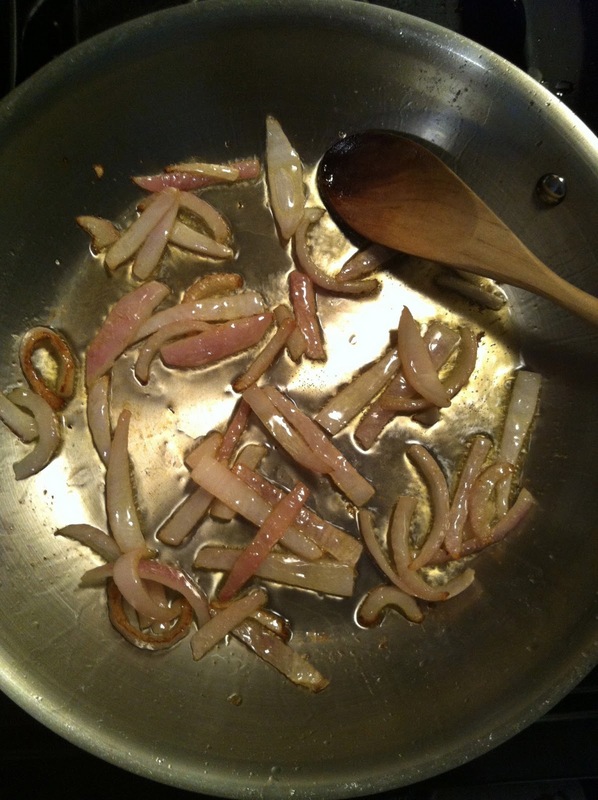 Stir regularly, but also give the onion periods of time to "stick" to the pan a bit so that it can brown. Add in 2 cloves of garlic, minced. Cook for about 30 seconds, being careful not to let the garlic burn. 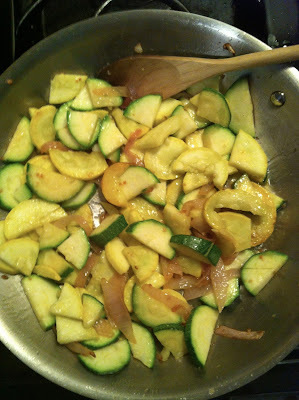 Then, add in your squash and zucchini. I used 1 full summer squash and 1 full zucchini, chopped into slices then halved or quartered. Stir to mix with the onion and garlic. Cook until the squash and zucchini also begins to soften, about 10 minutes or so. Now, time to mix everything together. Pour your cooked veggies (including the extra oil and garlic at the bottom of the pan) into a large bowl. Add in the chicken. 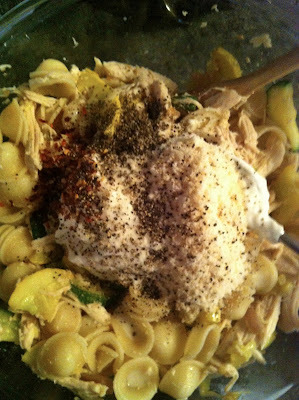 Stir in the pasta, as well as the remaining ingredients: almond milk, greek yogurt, cheese, and spices. Top with a bit of additional cheese to brown up on top. And bake for about 20 minutes. Easy! -Cook pasta according to package directions, until al dente. Drain. -Meanwhile, heat olive oil over medium heat. Add onion. Cook until the onion begins to brown and soften and sweeten, about 10 minutes or so. Stir regularly, but also give the onion periods of time to "stick" to the pan a bit so that it can brown. -Add garlic. Cook for about 30 seconds, being careful not to let burn. -Add squash and zucchini. 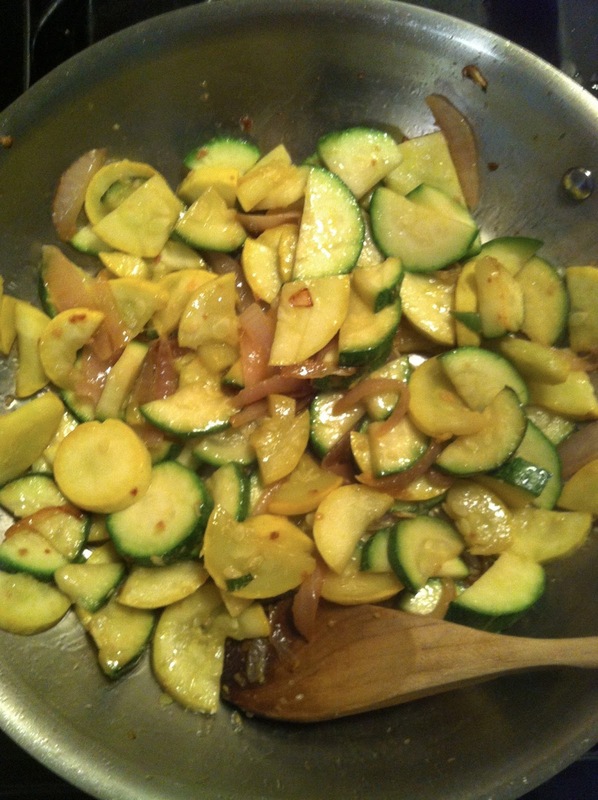 Stir into the onion and garlic and cook until the squash and zucchini begins to soften as well, about 10 minutes, stirring regularly. 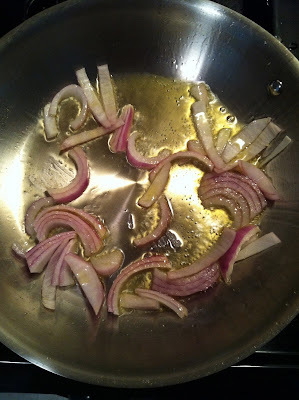 -Pour cooked veggies into a large bowl, including the extra oil and garlic at the bottom of the pan. Add cooked chicken. Add pasta, yogurt, milk, and spices. 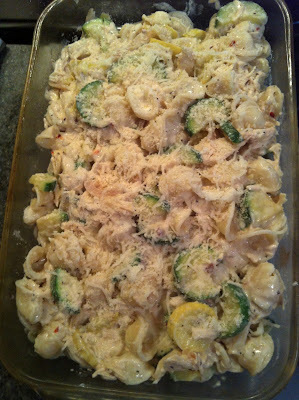 Add 1/4 cup parmesan cheese and 3 tbsp mozzarella cheese. Stir carefully to combine. 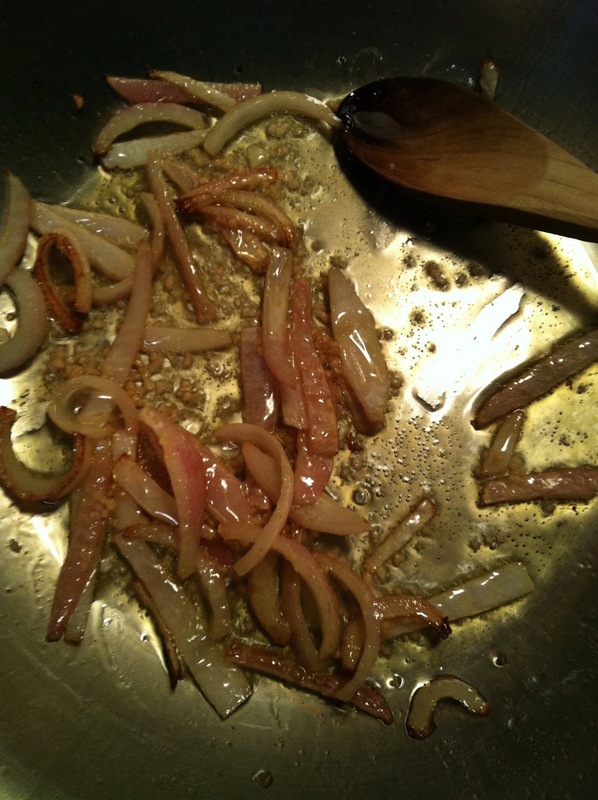 -Spread mixture into a casserole dish that you've sprayed lightly with cooking oil. Top with an additional tablespoon of mozzarella cheese and an additional tablespoon of parmesan. 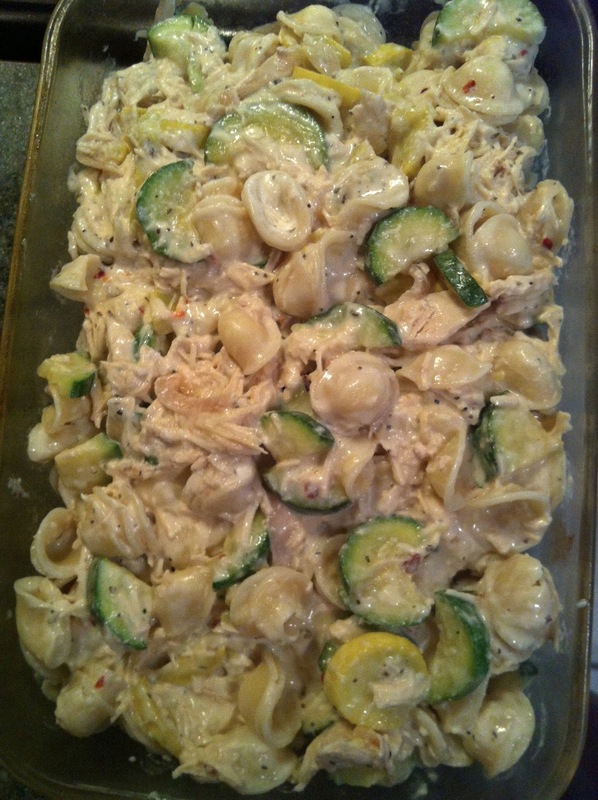 -Cook in preheated oven for about 20 minutes, or until hot and slightly browned on top.